Here's another reason to toss out those paper maps: the eMap. It's the size of a small, flat calculator, contains a 12 parallel channel GPS receiver, and weighs a mere six ounces. Even with its compact style, the eMap boasts an extra-large display for showing even more map data and the same power you've come to expect from GARMIN handhelds—even while operating for up to 12 hours on just two AA batteries. The eMap features an internal basemap containing information on North and South America including state and country boundaries, lakes, rivers, streams, airports, cities, towns, coastlines, and U.S., state, and interstate highways. In addition, the eMap provides exit information for the federal interstate highway system. With the eMap, you will know when you are near services such as food, lodging, and service stations. 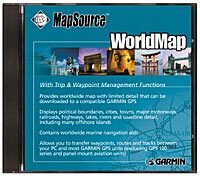 The eMap is compatible with GARMIN's complete line of downloadable MapSource™ CD-ROMs including U.S. Roads and Recreation, WorldMap, U.S. Topo, and MetroGuide U.S.A. When paired with the MetroGuide U.S.A. CD-ROM, the eMap has the ability to look up address and telephone number information for nearby services and points of interest. The eMAP will store eight or 16 megabytes of downloaded CD-ROM information at a time depending on the size of the cartridge you use in the unit. Designed with everyone in mind, this unit will take you from the car, to the hiking trail, to the beach without missing a beat. Το GPS eMap της GARMIN είναι από τα πιο διαδεδομένα μοντέλα. Έχει μικρό μέγεθος και μεγάλη ευανάγνωστη οθόνη στην οποία μπορούμε ανά πάσα στιγμή να βλέπουμε πολλές πληροφορίες με μεγάλη ακρίβεια, όπως τις γεωγραφικές συντεταγμένες του σημείου που είμαστε, το υψόμετρο, την ακριβή ώρα, την ταχύτητα μετακίνησης μας, την κατεύθυνση που ακολουθούμε καθώς και το σημείο μας στον ενσωματωμένο παγκόσμιο χάρτη. Όταν κυκλοφορήσει ο αναμενόμενος Ελληνικός αναλυτικός χάρτης από την GARMIN θα μπορούμε να βλέπουμε πολύ περισσότερες λεπτομέρειες των Ελληνικών πόλεων, της ξηράς και της θάλασσας. Το μοντέλο αυτό έχει χρησιμοποιηθεί πολύ σε συνδυασμό με πομποδέκτες και από τους ραδιοερασιτέχνες στο σύστημα APRS (Automating Position Reporting System) με άριστα αποτελέσματα. ΤΟ ΕΧΟΥΜΕ ΧΡΗΣΙΜΟΠΟΙΗΣΕΙ ΚΑΙ ΕΜΕΙΣ ΚΑΙ ΤΟ ΣΥΝΙΣΤΟΥΜΕ ΑΝΕΠΙΦΥΛΑΧΤΑ ! ΤΟ ΠΡΟΣΦΕΡΟΥΜΕ ΚΑΙ ΜΕ ΟΔΗΓΙΕΣ ΧΡΗΣΗΣ ΣΤΑ ΕΛΛΗΝΙΚΑ !!! ΚΑΙ ΟΔΗΓΙΕΣ ΡΥΘΜΙΣΗΣ ΓΙΑ ΝΑ ΔΕΙΧΝΕΙ ΣΥΝΤΕΤΑΓΜΕΝΕΣ ΕΓΣΑ' 87 ΠΟΥ ΧΡΗΣΙΜΟΠΟΙΕΙ Η ΓΕΩΓΡΑΦΙΚΗ ΥΠΗΡΕΣΙΑ ΣΤΡΑΤΟΥ ΣΤΟΥΣ ΣΤΡΑΤΙΩΤΙΚΟΥΣ ΧΑΡΤΕΣ !!! ΟΙ ΤΙΜΗ ΕΙΝΑΙ ΜΑΖΙ ME ΤΟ Φ.Π.Α. ΑΛΛΑ ΕΠΙΚΟΙΝΩΝΗΣΤΕ ΓΙΑ ΕΠΙΒΕΒΑΙΩΣΗ ΕΠΕΙΔΗ ΜΕΤΑΒΑΛΛΕΤΑΙ ΠΟΛΥ ΤΑΚΤΙΚΑ. 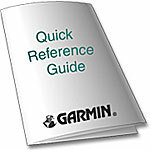 Download data from GARMIN's MetroGuide™ CD to find points of interest or look up address. Graphic map icons show the location of service stations, restaurants, ATMs and more from MetroGuide data. The Trip Computer keeps track of average and maximum speed, mileage and more. *To view or print this PDF, you must download the free Adobe Acrobat Reader software (Version 3 and above) from the Adobe website. Click on the button below to download Adobe Acrobat Reader now. * Subject to accuracy degradation to 100m 2DRMS under the United States Department of Defense-imposed Selective Availability Program. This new and improved remote antenna runs on a lower voltage so battery drain is minimized. Comes with two mounting options. Magnetic mount for the outside of your vehicle or boat. Suction mount holds antenna in place against the inside of your windshield or window. With 8 feet of cable and MCX connector. 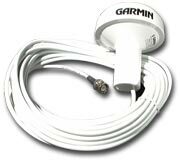 Size: 2.75"L x 2"W x .75"H.
How do you get from here to there if your GARMIN GPS has an MCX connector but your GARMIN external antenna has a BNC connector? Bridge the difference with this MCX to BNC adapter. This mounting bracket for eMap has all the qualities you're looking for: lightweight, portable, adjustable. Bracket is jointed, allowing you to position eMap out of the sun's glare. Comes with temporary and permanent adhesive disks that adhere the mount base to the dash. Just what you need if you're taking your eMap on a biking adventure. Snap eMap into this secure handlebar mount and it's ready to ride. Fits up to a one-inch diameter bar and is perfect for your bike, motorcycle or ATV. Includes hardware and instructions. Save a battery's life — buy an adapter. Plugs into any standard cigarette lighter receptacle to power your GPS. This data cable has bare wires at the end so you can hard wire your GPS directly to another electronic device. This allows you to send speed and position data to devices such as a chartplotter, computer, auto pilot, radar, etc. Data cable doesn't have power — you'll have to run off your unit's batteries. 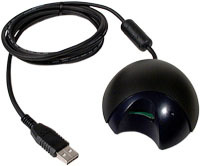 This cable allows you to make a powerful connection between your GPS and your PC. Create routes and waypoints on your PC and transfer them to your GPS. Also allows you to download map detail from MapSource CD-ROMs to compatible units. 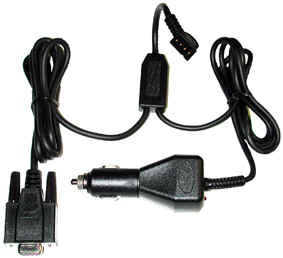 Cable features a standard 9-pin D connector. Does not provide wiring for external power. This cable allows you to make a powerful connection between your GPS and your PC. Create routes and waypoints on your PC and transfer them to your GPS. You can also download map detail from MapSource CD-ROMs to compatible units. Cable features a standard 9-pin D connector. Connects to any 12-volt receptacle. Max out the memory in your GPS unit with this data card. Holds up to 32 megabytes of data from MapSource CD-ROMs so you can download street-level map detail, points of interest, business addresses and phone numbers, topographic information and more. Max out the memory in your GPS unit with this data card. Holds up to 64 megabytes of data from MapSource CD-ROMs so you can download street-level map detail, points of interest, business addresses and phone numbers, topographic information and more. Max out the memory in your GPS unit with this data card. Holds up to 128 megabytes of data from MapSource CD-ROMs so you can download a ton of street-level map detail, points of interest, business addresses and phone numbers, topographic information and more. Kinda like a helmet for your eMap. This rubber cover protects your GPS in the event of an accidental drop. Make sure your eMap stays buffed up and ready for your next excursion. This trim leather carrying case has a magnetic snap closure. 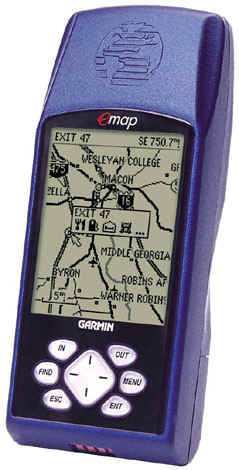 Note: MapSource Trip and Waypoint management functions are compatible with most GARMIN GPS units. The map download feature is compatible with several select GARMIN GPS units. Please see the MapSource Page for complete compatibility details. MapSource makes it easy to enhance the basemap of your compatible GPS unit. WorldMap provides basic worldwide map detail that includes political boundaries, cities, towns, major motorways, railroads, highways, lakes, rivers and coastline detail. You can also use MapSource to create routes and waypoints on your PC and transfer them to your GPS. 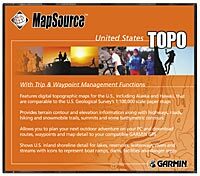 With the U.S. Topo CD and your PC, you can download topographic detail to your compatible GPS. You'll see terrain contour, elevation information, shoreline detail, bathymetric contours, hiking and snowmobile trails and more. You can also use MapSource to create routes and waypoints on your PC and transfer them to your GPS. 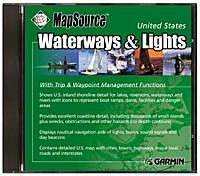 MapSource U.S. Waterways & Lights CD ROM contains maps made for boating and fishing enthusiasts. The MapSource U.S. Waterways & Lights CD provides inland and offshore detail to enhance the basemap of your compatible GARMIN GPS. Download the maps you need and let your GPS guide you on your next excursion by land or sea. Please note: The trip and waypoint management functions of this product work with nearly all GARMIN GPS units, excluding the GPS100 family and panel mount aviation units. The map download feature of this product is recommended for use with the GPS III Plus, NavTalk, GPS 12MAP, and GPSMAP 162/168. It is compatible with StreetPilot GPS, StreetPilot ColorMap, GPSMAP 295, and eMap, which require a GARMIN data card to upload map data to these compatible units. The Waterways & Lights product offers GPS 48 support which allows you to transfer nautical navaids from a worldwide database. When you install the GPS 48 support, there will be a selection to upload a particular lights region into the GPS 48. The regions are: North Amer, South Amer, Europe, Africa, Asia, S. Pacific.